And just to set the record straight on the utterly false statements you make: L. Ron Hubbard was never a disciple of Aleister Crowley. The two never even met. Your (whoever you are) characterization of the Founder of the Scientology religion is offensive in the extreme, and you should be utterly ashamed, if indeed it is possible for you to feel shame. You clearly created this disrespectful—and totally false—sham as clickbait, and as a Scientologist I strenuously object. And I have friends and colleagues of other religions or no religion who are equally incensed at your disrespect. Were you to have said anything remotely similar about Jews, you would correctly be labeled anti-Semitic. And if you disparaged Islam in such a fashion, you would also be labeled. 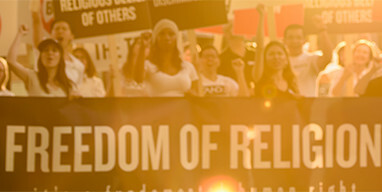 Bigotry is bigotry, and your characterization of the Founder of the Scientology religion was obviously intended to disparage him and the millions of Scientologists around the world, as well as millions more who share our principle that one should respect the religious beliefs of others. And just to set the record straight on the utterly false statements you make: L. Ron Hubbard was never a disciple of Aleister Crowley. The two never even met. Mr. Hubbard was still a young boy and living in a different part of the country during Crowley’s only extended stays in the United States. They never at any time in their lives crossed paths. Mr. Hubbard’s only connection to all of this was when, from late 1945 through mid-1946, then-Lieutenant Hubbard investigated Jack Parsons and his Agape Lodge on behalf of the Office of Naval Intelligence. Naval Intelligence had been concerned about Parsons since at least 1940. Mr. Hubbard later explained that authorities were highly concerned about the visits of nuclear physicists to Parsons’ home “whenever they came to Los Angeles because the [OTO] practiced black magic in the place and it was totally bugged and they were fed drugs, and it was highly insecure.” Mr. Hubbard’s work was successful—Parsons left the OTO and sold the home. You should also know, and I suspect you already do know, that no part of Scientology is taken from Crowley nor from the ancient Gnostic magicians from which Crowley derived much of his material. In a 1952 lecture, Mr. Hubbard described Crowley as a “mad old boy.” While it is possible to take any two bodies of data in the field of philosophy and find some crossover, however superficial, L. Ron Hubbard publicly stated in a lecture that he had examined the work of the ancient Gnostics and abandoned it, finding that it did not hold the answers he was seeking. My point in writing to you is, first, to express my contempt for your despicable words—that I am sure you know to be false but posted anyway from behind your veil of “anonymity.” And secondly to request that you exercise some concern and restraint when you presume to describe the religion of others. Better yet, why don’t you just leave religion alone and write about topics you know something about.